How many times have you gotten into stress overload this week? The word “mind” used here could also be translated as our thoughts or intentions. Likewise, the word “stayed” could be translated as leaned or rested. Therefore, the encouragement here is that we need to rest our thoughts and our plans on God. When we are sure that we are leaning on God with our plans, then we can have peace regardless of what happens with these plans. It is now up to God and not up to us. How much time do we spend talking with God about our plans? Do we allow God to give us input? Do we search out His Word for what he would want us to learn? Do we trust God with the results? If you are like me, this is very difficult to put into practice. I often put put together my plans and then quickly go into action. It is only after I failed that I realized that I never included God in my planning. Thought for this week: Spend some time each day simply talking with God about your plans. Be listening for Him to answer. In their careless humour lies. Say, whence comes it, their sweet grace? Scarcely know they Duty’s face. It is only natural for parents to have high hopes and dreams for their children. However, when we begin to see our children as a reflection or validation of us, we become the center of our dreams, and the children become our source of significance. When that happens in our home it affects the way we relate with our children, and subtly breaks down relationship. When we allow the success of our family to determine our security or sense of wellbeing we are seeking from it something God intends us to receive from Him. I am describing idolatry. When pride is working its work in us, we sincerely believe our personal opinions reflect God’s utmost priorities and standards. Sheltering is a critical part of parenting, but if parents keep it their primary focus, the children will grow up ill equipped to handle the temptations in the world.A child isolated from disease may appear to be of the greatest health to his parents, but the health of the human body is only proven by how it withstands an attack. A weak constitution succumbs to every germ and virus – a strong one fights them off. Our spiritual and moral health is developed and proved in the same way. I am convinced that the most contagious parenting is living a heartfelt faith before your children. Fruitful interaction is not about what you do to your young people, but who you are with them. It’s about having a real faith in God, and expressing it in a real relationship with a real person–not about methods and self-working principles. God intends that the side-effect of loving Jesus and enjoying the grace of the gospel will be that all people–including our children–will be touched by the Savior in us. I encourage you all to read the entire article here. Forever. And always has been. Can you imagine it? No. He never was not and always will be. His knowledge has no limits. I don’t know what that means, but do know that Scripture teaches He knew each of us by name before He laid the foundations of the Earth. He knows each hair on our head and every one of the trillions and trillions of stars that He created. Boundless in time and boundless in comprehension. He is loyal and faithful, even to those that leave him. Us. He loved us before we loved him and after we betrayed his love. But his love and justice are also limitless and eternal. Christ. Cross. Grace. The Fourth Circuit has recently released an opinion affirming the right of churches (and other religious organizations) to abide by their religious convictions in making decisions about employees. Federal law prohibits religious discrimination—a good thing when secular employers discriminate against people of faith—but churches could not achieve their spiritual mission if they could not “discriminate” by selecting employees who fully support that mission. The case is Kennedy v. St. Joseph’s Ministries, Inc. Lori Kennedy was employed as a geriatric nursing assistant at the Catholic nursing care facility operated by a religious order. Residents and their families complained about Kennedy’s long skirts and head coverings—clothing she wore as a matter of religious principle. Kennedy was told that her clothing was “inappropriate for a Catholic facility,” and she was discharged when she refused to change it. In ruling for the church employer, the Fourth Circuit followed U.S. Supreme Court precedent affirming the right of a religious organization to “discriminate” on the basis of religion in its hiring decisions. A case with similar issues will be heard in the U.S. Supreme Court on October 5, 2011. Hosanna Tabor-Lutheran v. Perich. (I wrote a brief for that case on behalf of Justice and Freedom Fund.) Perich, a commissioned minister according to Lutheran tradition, taught at a church-owned school. She sued after the church refused to immediately reinstate her during a time she was on disability leave. Hosanna concerns the court-created “ministerial exception” that respects the right of a religious organization to select the persons who will carry out its religious mission. The principle is particularly applicable to pastors, but it extends much further and is based on the First Amendment Free Exercise Clause. Kennedy is about an exemption created by federal statute, and it covers all employees—not just “ministerial” employees. Both cases are about protecting the right and ability of religious organizations to handle their internal business free of state interference. The Religion Clauses of the First Amendment were designed to guard that right. RALEIGH–The North Carolina State Senate voted yesterday to concur with a bi-partisan vote in the North Carolina State House to pass a Marriage Protection Amendment recognizing marriage as the legal union of one man and one woman. The Senate passed the Amendment 30-16, while the House vote was 75 to 42. Passage of the Marriage Protection Amendment by both houses of the General Assembly allows the issue to go to a vote of the people on the next primary election ballot scheduled to be held May, 2012. If a majority of North Carolina voters support the Marriage Amendment in this referendum, the language of the amendment will be permanently included in the North Carolina Constitution, and North Carolina will join thirty other states that have protected marriage in their constitutions. The floor debate in the Senate included discussion of the economic advantages the Marriage Amendment would bring toNorth Carolina. States that have protected marriage have better business rankings than states that have not or states that have redefined marriage. “Whether it’s Forbes magazine, the American Legislative Exchange Council, CNBC, Chief Executive Magazine or the National Chamber of Commerce, the overwhelming majority of the states in the top ten in economic performance in the country are states that protect marriage in their constitutions,” Fitzgerald said. The Marriage Amendment will also protect private businesses by allowing them to continue to offer benefits according to their own strategic business decisions instead of government mandates. Here is a quick and easy way to provide resources for women with an unplanned pregnancy: The application form for the “Choose Life” plate is available HERE for download. 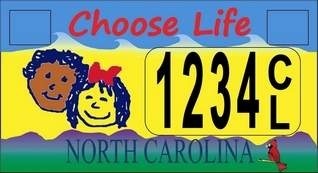 To apply for the “Choose Life” plate you must fill out the application form and return it along with the applicable fee ($25 for a regular DMV-issued “Choose Life” plate or $55 for a four-character personalized “Choose Life” plate) to the Carolina Pregnancy Care Fellowship (CPCF) at P.O. Box 3888, Charlotte, NC 28278. The DMV requires a third party-in this case the CPCF-to collect the initial 300 applications and fees. Once the CPCF submits all the applications to DMV, the plates will be made and sent to applicants. After the 300 threshold has been met, new applications for the “Choose Life” plate should be directed to the DMV directly. This specialty license plate will cost drivers that opt to purchase the plate an extra $25 per year for the DMV issued “Choose Life” plate or an extra $55 per year for a personalized “Choose Life” plate. This fee is in addition to the regular DMV vehicle registration fee. Of the additional $25, $15 goes to the CPCF, a nonprofit group that will distribute the funds to the state’s Pregnancy Resource Centers (PRCs). PRCs are non-profit, pro-life organizations located around the state that provide compassionate alternatives to abortion and help for women facing unplanned pregnancies, including counseling and other free-of-charge services.